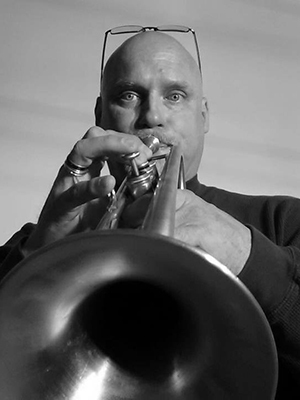 Mr. Figge is a professional freelance trumpet player with over 30 years of international and domestic performing experience. His performance experience includes: Symphonic and Chamber Orchestra, Big Band, Jazz Band, Polka Band, Liturgical Music, British Brass Band, Concert Band, Commercial Studio Work, Brass Quintet/Quartet, Brass Choir, Guest Artist Soloist, Weddings, funerals and Drum & Bugle Corps, and in 2009 Mr. Figge placed 3rd in the High Brass Solo Competition at the DCA World Championships in New York. Mr. Figge studied trumpet at both UW- Eau Claire, and UW-Milwaukee. While still in college Mr. Figge was the trumpet instructor at the Brass Bell Music Store in Milwaukee and provided private lessons to the trumpet sections at South Milwaukee High School, St. Francis High School, and Cudahy High School. He was a brass technician with Pioneer II Drum & Bugle Corps in Milwaukee. In 2014 Mr. Figge moved to Waupun where he currently resides and has worked with brass students at Waupun High School as they prepared for Solo Ensemble. Mr. Figge is going to be one of the most enthusiastic and passionate musicians and teachers you will ever meet. He plays because he loves to make music and he definitely tries to instill these attributes in his students.